This is the HR data from Garmin from my run today. Now granted, I haven't run in about 3 weeks and definitely decided to take it slow but what's going on?? That center line is a HR of 114. If you look most of my run was below that line. Huh?? I only went over, and got my HR up there, when my speed increased significantly. 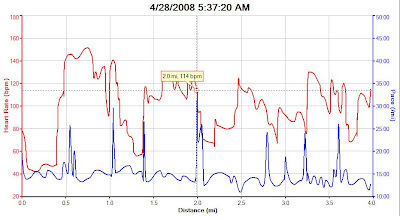 Ignore the first mile of data, my HR is never steady that first mile and always looks weird. But look at mile 2.5, I was doing close to an 11 minute mile and my HR was only slightly above 120??? Huh??? Could that possibly be right?? Could my aerobic capacity have gotten that much better from consistent training?? Or do you think my HRM is broken?? I honestly don't know what to think about this. I was not breathing incredibly hard during my run. In fact, I breath much harder during my strength sessions. Could the interval sessions I use for strength training have helped that much?? Wow!!! I think it may be time to step up my speed and see what happens. Next run, on Thursday, will be with Garmin set to a pace and me attempting to keep up with it. We'll see how it goes. Hey good job! I'm guessing that with your increased fitness level, more intensity does not equal higher heart rate, or at least too high to be safe. In fact, it looks pretty steady. Go for it! What do you have to lose? I'm sure you feel a lot like me, afraid to push it for fear of blowing up. But I've been thinking lately, unless I actually try it, how will I know? It is amazing what cross/strength training and some rest will do for an heart rate. 120 or below is great for 11 minute mile. Saw your goals for your upcoming marathons - good luck on your training. Both marathons sound wonderful! i've gotta get a garmin. which one do you have? and congrats on the seriously fit heart you've got there.